Every other Wednesday, while our wives/girlfriends are at book club, the guys get an opportunity to hang out for a night of gaming. This week was no exception, however only David and I were able to get together. But this gave me an opportunity to teach him a couple of games and play another he’d only played once before. Below are 3 mini session reports from our mid week gaming session. We started off with Tobago. I ran him through all of the rules while I set up the board. Then we ran through an example turn of play and treasure distribution and then got started on the real thing. After a few turns back and forth, the first treasure was ready to dig up near me. I hadn’t contributed to it though and it was on the opposite side of the island from him. I opted to let him waste some moves to drive over and get it himself. A couple turns later I had dug up the treasure I was working on. I scored 5 treasure cards while he watched. The next treasure was split equally. He finally made his way over – picking up a couple of amulets on the way – and scored his 4 card treasure. The next treasures that we dug up had both of our markers on them. After another split treasure was dug up, and after he grabbed a big treasure card, the first curse hit. We both had amulets so no harm was done. One more split treasure was dug up safely. The next treasure was all mine. I looked at 5 cards and none were cursed. I shuffled in the extra card and flipped up a 4 treasure. Nice. The next one was not so nice – curse! Again an amulet protected me from losing any cards, but that one hurt me. David had been stockpiling amulets and some good play at the end allowed him to get the lion’s share of the last treasure. Final Score: Rick 38, David 50. Next I brought out Ingenious. This one was also a new one for him so we ran through the simple rules as I set up the game. We were playing in a couple minutes. We each built on the same half of the board until it was full. We were pretty close on all of our 6 colors. I did have an advantage though: I had 1 or 2 more orange and blue than he did and those colors had been closed off. Realizing this he put those colors back into play. He spent the second half of the game playing catch up. I scored the only Ingenious of the game on yellow and was then able to score on my lowest color with a double red tile. The game was over before his last two plays, but the final score was close. It wasn’t too late so we decided to break the tie with a game of Small World. David had one game of this under his belt already so we were able to set-up and get down to business right away. He started out with Marauding Trolls. This combination allowed him to spread out quickly but still have good defenses. I chose Merchant Skeletons for my first race. They spread out a little more slowly but they scored well each turn. He put the trolls into decline after 2 turns while I kept rolling with my skeletons. He next chose Hordes of Wizards and this is where the game really took off for him. The trolls had 1/3 of the board while he could expand the wizards on another 1/3. I abandoned my Skeletons (in hindsight a little too late) and then grabbed Underworld Ratmen. I started to make a dent in his Wizards and Trolls, but not nearly enough. He was able to score 20 and 15 coins on turns 6 and 7. He went in decline on turn 8 and only scored 4 coins. It was my opportunity to spread out my Ratmen on the newly empty regions. The last few turns went miserably for him. He chose Berserk Dwarves and rolled zeroes 7 consectutive times! I grabbed Alchemist Kobolds on the final turn and was able to make up a little ground, but it was too little too late. Although only two of us made it we had a great time. It was good being able to to teach a game to just one person at a time. Especially when the game is the same in terms of rules and fun factor with 2 people as it is with 4+. Any other fun games that scale equally as well? I hold up a crayon to my two-year old as we start to draw a picture with her crayons. I wasn’t quizzing her on her knowledge of colors. I wanted to draw a tree and wasn’t sure if the crayon I was holding should be used for the leaves or the trunk. I’m colorblind. You probably see a 74. I see a 21. I get that question a lot after someone finds out about my colorblindness. And it’s a very difficult one to answer – how do you describe a color? I’m red/green colorblind (deuteranopic). I can see the colors red and green (or blue and purple), but it is difficult to distinguish between the two at times. 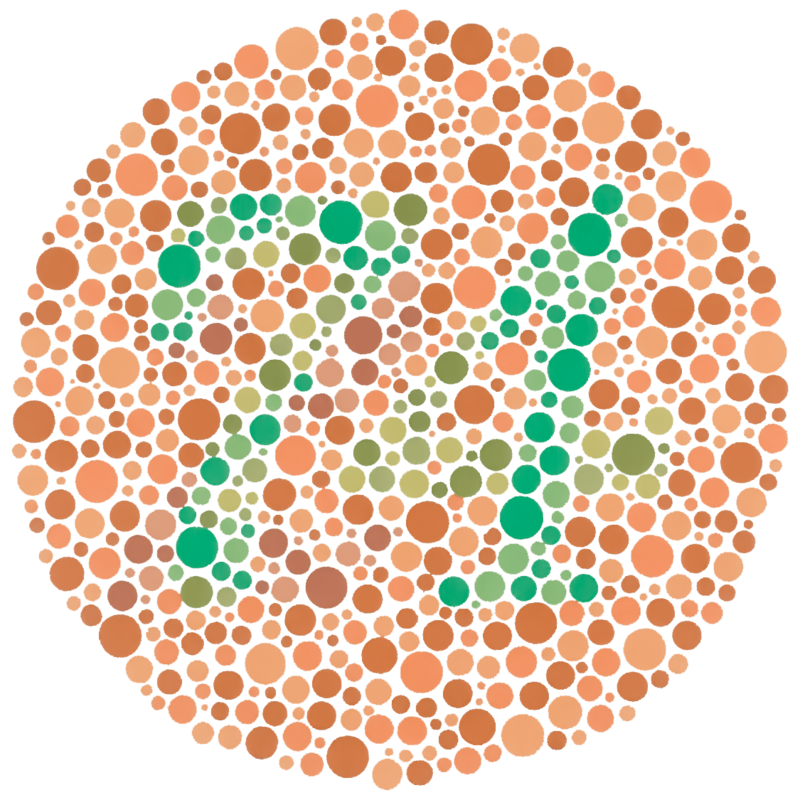 Taking a colorblindness test can diagnose the condition and help to explain what I see, but most people still don’t get it. Now I can tell someone to Google “colorblind” and get sites that show images side by side of what people like me see. This site does a good job. Those color vision tests all look the same to me! I’ve learned various ways to handle colors in my environment. For stop lights, the red and green are actually designed to be different looking so the green looks almost white to my eyes. There are also other clues that can be used: the red light is always on top or on the left when mounted sideways. In other situations, if I really can’t see the color I’ll ask someone. Usually my wife or daughter can help me out, but I’ve also asked complete strangers. Sometimes once I’ve been told something is red or green I’m able to then see the colors. I think somehow my brain compensates for what my eyes miss. I also change my behavior to help avoid the issue. The color of clothes I buy is affected. As an engineer I often make charts of data. My charts will always have a color and shape associated with each different label. This is good practice for everybody: if you print out a report/presentation it should be legible in color OR black and white. I was getting to that… Colorblindness definitely affects my board gaming. The most obvious (and generally least important) result is when I pick out my playing piece. I almost always pick blue. Yellow, white or black are my next choices. I generally avoid green, red, orange or brown. If each player in a game only has one token, it usually isn’t a problem keeping track of the colors (a conscious effort on my part at times). However, if there are several tokens and they will be moved around a lot (Carcassonne for example), I will sometimes ask other players not to use certain colors. When the colors are a part of the game or can’t be avoided, it may be a challenge. I played Power Grid for the first time a few weeks ago. The board has a map with several regions, each a different color. We only had three players so only three of those regions are in play. I had a hard time figuring out which cities were in play and which were out. My first game of Ticket to Ride was also difficult. The colored train routes and cards were very similar to my eye. Usually the colors aren’t a challenge and don’t effect my play, but not always. I already suffer from analysis paralysis in some games. The extra few seconds I need to concentrate on who-has-what-tokens-where can slow me down even more. To keep from slowing down game play, I may make a bad move because I didn’t realize that red enemy token was actually a green friendly one. The colors may look alike, but the shapes don't. Fortunately some games design around these issues. I think the biggest key for a game design is to double up on the differences by using shapes AND colors. Ingenious is a game of matching colored tiles. Blue and purple?! Red, green and orange?! This game could have been a nightmare. But each color also has an associated shape. This makes it very easy for me to quickly see what I have and where I can play. We also have a dominoes set that each number has a different color. My daughter matches the colors while I match the number of dots – this helps both of us. The Ticket to Ride designers got feedback about difficulty in distinguishing some colors and added symbols to the routes in later editions. And when the game is designed poorly (at least in color management), I try to adapt. In a second game of Power Grid, we blocked off the border of the regions we were using with the city tokens of a fourth color. It was a great help and makes me wonder why they didn’t draw boundaries between the colors. A game like Here I Stand looked confusing at first glance – the Ottoman green and Protestant Brown looked a lot alike. After playing, I realized it didn’t matter as those powers’ tokens never interact so I don’t have to worry about confusing the colors. And if it came down to it for a game I really liked that after repeated plays I still had troubles with – I would look at making my own board/tokens to eliminate any confusion. Fortunately, I haven’t had to do that…yet!